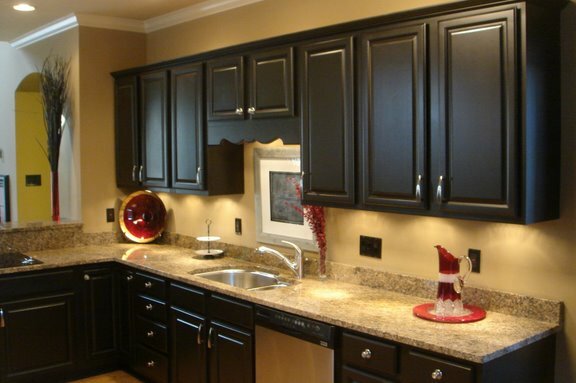 Reface your cabinets. We’re not saying you must gut and rebuild. Instead of spending, say, $5,000 on new cabinets, save some serious cash and reface the ones you have for under $1,000. It’s amazing what a little veneer and some new doors can do to brighten an aging space. For full step-by-step instructions, shopping list, and tools list, see How to Reface Kitchen Cabinets. Install a Pull-Out Shelf. Make the most of your kitchen’s existing storage space by installing a pull-out shelf in one—or all—of the base cabinets. The shelf resembles a shallow drawer that glides out for easy access to items stored in the back of the cabinet. For full step-by-step instructions, shopping list, and tools list, see How to Install a Pull-Out Cabinet Shelf. Put in Undercabinet Lighting. There’s a missing element in most American kitchens, and it’s not a $7,500 range or a 4-acre refrigerator. No, it’s simply good lighting. The hidden fixtures of undercabinet task lighting, which are fairly easy to install, bathe the countertop in bright white light. For full step-by-step instructions, shopping list, and tools list, see How to Install Undercabinet Lighting. Build a Butcher Block Island. Butcher-block islands mimicking 19th-century worktables are perfect for toning down the coldness of stone counters and metal appliances in modern cook spaces. You can bring this classic aesthetic to your kitchen by constructing a prep island from easy-to-buy materials. For full step-by-step instructions, shopping list, and tools list, see How to Build a Butcher Block Island. Build a Sideboard. You can enhance a few stock kitchen base cabinets with molding, furniture feet, and knobs to produce a handcrafted sideboard for a fraction of the cost of buying one ready-made. For full step-by-step instructions, shopping list, and tools list, see How to Build a Sideboard. Build a Window Seat. As attractive as window seats are, only a few older homes with deep dormers seem to have them. The good news is, you don’t need a large budget or a professional handyman to install one. For full step-by-step instructions, shopping list, and tools list, see How to Build a Window Seat. Add a Plate Rack. You could leave your dishes tucked away behind closed doors. Or, if they’re interesting and vibrant, you could create a place to display them, freeing up precious storage space and adding a splash of color to your kitchen. See how to make simple slotted storage from a kit, in How to Build a Plate Rack Cabinet Insert. Add Crown Molding. Nothing screams, “I spent lots of money on custom cabinets!” like crown molding. The trim transforms your kitchen storage into a seamless design. See how to nail the clever trick, in How to Install Kitchen Cabinet Crown Molding.